I’ve started Interview series on Blogail with Jane Sheeba who has been into blogging from last 10 year. She started blogging in 2007 when she was doing Ph. D in the field of Medical Physics at Lancaster University. Since 2007, She has been learning and sharing knowledge with her readers on Jane Sheeba . 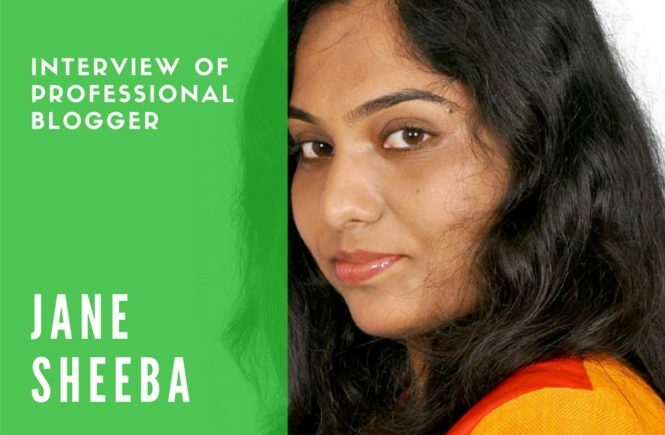 She is one of the top Professional blogger of India who has been featured in many popular blogs like Shoutmeloud and has been seen on magazines like Search Engine Journal and Problogger . 1. Hey Jane , Please tell us about yourself and blogs that you’re managing now ? 2. You’re scientist and blogger too, Please tell us how did you start blogging and publish your first blog if its still alive then share little about that blog ? I just started blogging to avoid boredom and loneliness when I was in the UK, doing my Ph. D. I should say that the start was merely accidental. Since I knew nothing, I just started a couple of blogs on Google’s blogger platform. And got those blogs deleted one fine day (I don’t know the reason). And then I got serious about blogging and started by own multi-niche self-hosted blog (that blog is also no more now!). 3. During beginning days of blogging everyone face challenges. Have you faced any challenge in your blogging journey ? if yes what was that ? Yes a lot of challenges to be honest. I seriously had no clue what I was doing – apart from the passion to start a business. I didn’t know what I was doing and that was my biggest challenge. Then I started to realize the importance of getting clarity. Once I got to that point things really skyrocketed. My second biggest challenge was to having to figure out everything by trial and error. There was not too much (abundant) help available as it is today. 5. How do you manage your blog and what strategy do you follow to improve your blog ranking and traffic ? I have multiple businesses/blogs so managing can become quite challenging if I don’t have long term and short term plans. I always make sure that I have yearly, monthly and weekly goals to hit regarding every business that I own. As to ranking and traffic, I don’t use any secret technique. I just create content that people love and take care of on-page optimization. Of course I do keyword research – I’m a big user of SEMrush. Check out SEMrush Review Why Should you buy it today ? 6. I think or says that Blogging is not easy task but some newbies take it wrong. What you want to say about this to Newbies who start blogging after looking at income of bloggers ? Starting a blog inspired by the income reports of other bloggers is not a bad thing. But starting a blog with the wrong mindset is a failure equation. Just because a big blogger is earning thousands of dollars a month doesn’t mean that he/she has got to that point overnight or just by writing and publishing a few blog posts. Having the wrong notion that blogging is a get rich quick scheme or by simply starting a blog on a niche and publishing few pieces of content will get them there is wrong. When someone wants to start a blog, he/she has to think about the “business” first. Merely having a blog is not having a business! 7. We have many monetizing methods to make money. Which one do you follow and which is one best ? I actually find that using a combination of monetization methods work best for me and is the safest option! Relying on one particular stream of income is not only inefficient but also highly risky. So I split my income between various active and passive streams. Some particular methods involve selling my own products and services, and affiliate marketing. I have a free e-book where I discuss in detail about this > Can I REALLY make money blogging? 8. When did you make your first income from your blog and how did you feel when you get that money in your hand ? My first blogging income was from Adsense. And I got paid in cheque (nowadays I get my payment directly to my bank account). 9. I’ve seen many blogger who faced obstacles from family. Have you faced any ? My case has been totally the opposite. My family has supported me in all my decisions regarding business. My hubby has given me the best moral, emotional and even financial support when I started out. My parents and in-laws totally welcomed my idea of giving up my posh and well-paid scientist job for starting my business. I should say I’m blessed. 10. Motivation keeps us going. What and who motivates you the most for your journey ? There are 2 things that motivate me. (1) My own vision of being an entrepreneur. I keep visualizing my freedom, flexibility and the ability to be present myself between the two important regimes of my life – family and business. I get to choose how much time and energy to spend on both of them! (2) Of course my family! 11. People often talk about SEO and every one has their own thought. What you think SEO is and How any one can optimize their blog well ? Share some tips for our readers . SEO is mostly not what bloggers think. Keyword research is important from my point of view – this is not just to please the bots but to have an idea what people are actively looking for! And creating content that fits your audience is a must. Using keywords and LSI terms to optimise the content comes next. Using an SEO plugin like Yoast SEO will help you with on-page optimization. Quite some off page optimization is important too – backlinks. I highly recommend doing guest blogging – as this not only helps building backlinks but mainly to build your brand, invite lots of new visitors and establish your authority. SEO is not merely about focusing on the bots. It is about providing value to the readers as well as making sure that you do the right kind of optimization so those readers will actually make use of the content you publish. 12. Once I read ” Blogosphere is becoming crowed now days ” on your blog. What do you think about challenges bloggers will face in upcoming days and how they can overcome this ? Yes even today the blogosphere is very crowded. Many niches are quite saturated. But the point is – it is not about the competitors. It is about the bloggers themselves. No matter how crowded or competitive a niche is, standing out and being unique makes everything simple! Do not try to copy the big bloggers. Just do things your way and you will see the benefits. 13. Every one has favorite blog in their list which they read regularly. Can you share your list of favorite blogs ? Are a few that I regularly read. 14. I’ve seen many guest post of yours on many top blogs. So want to know How do guest post help in blogging and what are benefits of guest blogging ? As I said earlier, guest blogging is mostly seen as a link building technique. But I see it as a relationship-building portal – where I can connect with many host bloggers and their audience. Backlinks are a sweet by-product of guest blogging since those links are usually do-followed and are within content. I have talked about the benefits of guest blogging here in this post > Why Should You Guest Blog ? 15. What SEO tools and hosting server are using for your blogs ? Which wordpress hosting is good for starters ? I use SEMrush regularly. I also use SEOPressor for on-page optimization. For hosting I recommend Knownhost and Siteground. I highly recommend self-hosted WordPress option for bloggers. 16. Last but not least , Newbies keep looking for tips from top bloggers. So what message will you pass to our readers ? ← How to create a free blogspot Blog ? Jane is a great blogger and one many of us look up to. I had a chat with her while taking her interview on my blog and it was something I never dreamt of having. She is too kind and even readily offered me some great tips. Thanks as well Ravinder, for bringing us this wonderful interview. I liked the story of Jane Sheeba, and that’s why I am subscribing to her blog now! Keep interviewing the beasty marketers and bloggers who are an inspiration for us. thanks for sharing this interview. it inspires newbie bloggers like me. wordpress is the best platform to use for blogging in my view.